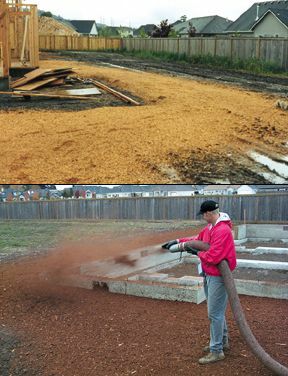 The ultimate in mud control is the ability to blow mulch or sawdust around the foundations and pathways at new construction or remodel sites. Workers stay drier and work more efficiently without tracking mud into the work area. In addition, we can provide your farm animals with mud control with an easy blown-in application where other equipment cant access.